We couldn't do it without help! We are incredibly grateful to have the support of the construction industry. 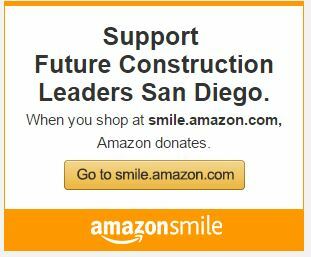 Future Construction Leaders of San Diego offers a variety of tax-deductible sponsorship opportunities for businesses, organizations and individuals to show their support for developing the construction workforce of the future. We recognize our sponsors in a variety of ways based on the program and level of contribution. Please click on the green buttons below each program to see a complete list for each sponsorship level. For more than 10 years Camp NAWIC San Diego has been introducing 8th-12th grade girls to careers in construction. The camp provides a unique week-long, hands-on approach to the trades at no cost to participants. Many Camp NAWIC graduates return year after year to mentor younger campers and learn new skills. Twenty-five percent of all Camp NAWIC graduates pursue higher education or apprenticeship training in construction careers. DPR Construction is a unique technical builder with a passion for results. Ranked in the top 50 general contractors in the country since 1997, we are a national commercial contractor and construction manager that has grown with our customers by delivering measurably more value. Learn more at https://www.dpr.com/. PSSI’s structures have been an essential part of life in San Diego and across Southern California since 1995. Punctuating the skylines of the region, our projects encompass virtually all industries, designs and functions. NECA is the voice of the electrical construction industry. NECA has provided over a century of service to the $130 billion electrical construction industry that brings power, light, and communication technology to buildings and communities across the United States. The San Diego Chapter was chartered in 1942, and today represents more than 100 electrical contractors with an elected Board of Directors and a full-time professional staff. The Swinerton Foundation was formed in 2002 to act as the charitable arm of the Swinerton company for which all charitable giving would be centralized or guided through. After fifteen years, the Foundation’s Board of Directors adopted a new mission and main focus areas, which you will find here on this website. Although the corporation is located in San Francisco, California, we provide funding to non-profit organizations across the United States. Condon Johnson & Associates, Inc. The Design Drafting Competition introduces San Diego County high school and college students to the construction industry by asking them to address a design problem created by a licensed architect or engineer. Local and regional winners move on to national-level competition, where they receive additional monetary prizes. Each year we raise money through sponsorships to gift two types of scholarships. The first scholarship type is dedicated to a male or female student pursuing any college degree who has a parent employed in the San Diego construction industry. The second scholarship is awarded to a female student pursuing a college degree in a construction-related profession such as architecture, engineering, or construction management. We are thrilled to have Rudolph and Sletten as a High Rise ($500) sponsor of the 2019 Design Drafting Competition and a Silver ($1,000) sponsor of the 2019 scholarship program. Rudolph and Sletten provide quality-oriented general contracting and construction management services on all types of projects with an emphasis on those markets where our technical expertise and quality excel—life sciences, higher education, technology, healthcare and justice. Learn more at https://www.rsconstruction.com/. The award-winning Block Kids Building Program introduces elementary school children to construction industry careers at a young age. Sponsored by local National Association of Women in Construction (NAWIC) chapters and the following supportive businesses, the competition is free for the students. DPR Construction is a unique technical builder with a passion for results. Ranked in the top 50 general contractors in the country since 1997, we are a national commercial contractor and construction manager that has grown with our customers by delivering measurably more value. Interested in reaching K-6th grade students and their parents? Learn more about Block Kids sponsorships and volunteer opportunities.